Just imagine that you appear on another planet with strange surrealistic trees resembling turned umbrellas or walk through a Jurassic park where from time to time you meet fantastical bottle trees edging the ragged peaks of the mountains hiding beyond the clouds or the brooks leading to the oases surrounded by luxuriant vegetation, a habitat of a great variety of species of the ancient world. The Socotra’s landscapes untouched by civilization have stood the test of time. Deserted plains, grand plateaus, deep gorges, mysterious caves, picturesque widely separated ramshackle houses and stone structures of remote settlements make a timeless picture looking as though it was painted in the prehistoric times. The majestic cliffs rising over the two ends of Socotra look like gigantic castellated walls of medieval loopholes. They were the first objects that saluted ancient sailors’ eye and put probably them in fear. One can easily imagine Sinbad the Sailor standing on the nose of his dhow, looking narrowly at the cliffs of Ras Momi in the east or Ras Bidoh in the west, and thinking of the adventures he might expect on the shore. These were most likely the Momi rocks where Apostle Foma suffered a shipwreck during his travel to India in 53 A.D. He stayed on the island and christened its inhabitants who remained Christians up to 19th century. 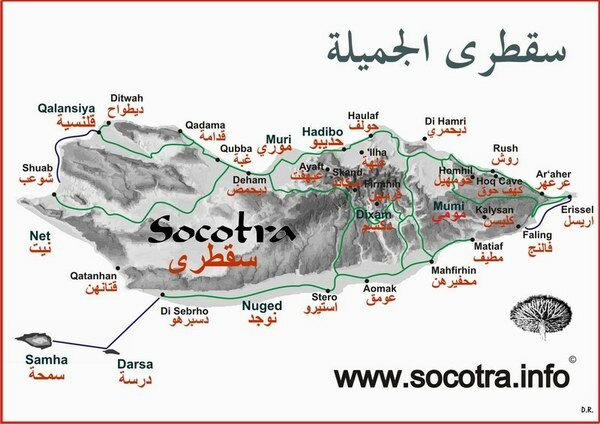 Today the Socotra Islands preserve the charm of remote ages as their most part has not practically changed since the time it had been explored by first travellers. Far from Hadiboh’s urban vanity the mountains covered with the Dragon’s Blood and Frankincense trees and other unusual plants wait for their explorers. Here one can enjoy breath-taking views of canyons and turquois mountain pools inviting travellers to have a rest and to reminisce all over they have experienced. During your travel you will meet hospitable and talkative herders and fishers who get pleasure from telling about their way of life. Bird-lovers will surely be able to see if not all, but most of the unique bird kinds just for a few days. You can take walking- and car-trips of any difficulty level, to explore caves, to go boating and to travel aboard a camel. Your trips to the island can be both short- and long-time. There is something to enjoy for everyone fond of nature and adventure. Hadiboh is a rather dirty and noisy city. But if you go eastward from Hadiboh for about 20 minutes you will see two valleys inhabited by a great many birds, the right place to enjoy most beautiful sundowns. It is also very interesting to watch young fishers and children playing in pools surrounded by palm trees or to join an evening conversation between old inhabitants by the sea. The east and the west part of the island can be reached by car, but your trip may be more interesting if you combine it with a sea-voyage. For example, if you want to go to the west Shuab Bay it is good to drive to Qalansiyah first and to spend an evening in the beautiful Detwah Lagoon. Next day you can go to Shuab Cape by boat and try to come back before afternoon wind starts blowing. You will get lots of impressions from a sea-voyage when turning round gigantic cliffs, admiring dolphins and watching Socotran gannets, red-billed tropic birds and other sea birds. Divers will have a good chance to dive to the “Sunrise” wrack. The underwater world of other islands is more interesting but requires more thorough planning and taking additional security measures before diving into it. A hike up the Haggeher Mountains is a must for the adventure seeker. It usually takes 3-4 days to climb forest-covered mountain ridges, to cross such impressive canyons as Shitahen, to go down to hilly pastures intricately divided by low stone walls and to climb again onto exposed rocks. It is the right place to see how the sun slowly disappears from the scene and the domed hills vanish with its last rays. If you put up a tent here on a full moon night, you will be awed by dazzling yellow brightness of the beautiful moon coming out of the saw-tooth peaks. And in the morning you will see the unforgettable rising of the sun. Most of such trekking routes require special logistic activities, accompaniment of camels carrying your personal things, products and camping equipment. Most of the suggested trails or, at least in part, are accessible by jeeps with a local driver or a guide whose company is very advisable for exploring the island. After driving two thirds of the way across the island from the north coast you will see unearthly forests of frankincense trees and desert-roses. Your guides will show you dragon’s blood trees, dwarf bottle-shaped trees and other endemic plants. In the evening you will be able to relax by observing them making a fire with just a few dry twigs. In no time, a cup of hot, sweet tea and a plate of rice are ready. If you plan to rest on the island it is necessary to realize the living conditions you are expected to have. Though Hadiboh has a number of 2*hotels, it is much better to stay overnight at camping sites. Hadiboh is a very dirty city, full of mosquitos and a lack of sights. Even more, it is a usual practice to switch off electricity at 6:00 a.m. So, the guests of hotels usually wake up because their air conditioners or fans stop operating. We also remind you that Socotrans are not good cookers. Their traditional food is fish, goat’s flesh and rice. A farming sector is not practically developed on the island. So, most products are supplied here by sea. Spending a night in Hadiboh you can have supper in one of local restaurants serving grilled fish, beans and a plain breakfast. Staying at camping sites you will sleep in light tents. A tourist mat and a sleeping bag are enough to make your overnight stop comfortable. Your guides or owners of camping sites will make for you rice, pasta, stewed vegetables and a piece of traditional fish. All camping sites are equipped with shower and toilet rooms. “Wild” camping sites are usually located near fresh water pools where you can wash away sea salt.